This is part of the period that saw the collapse of comic, the end of the golden age. 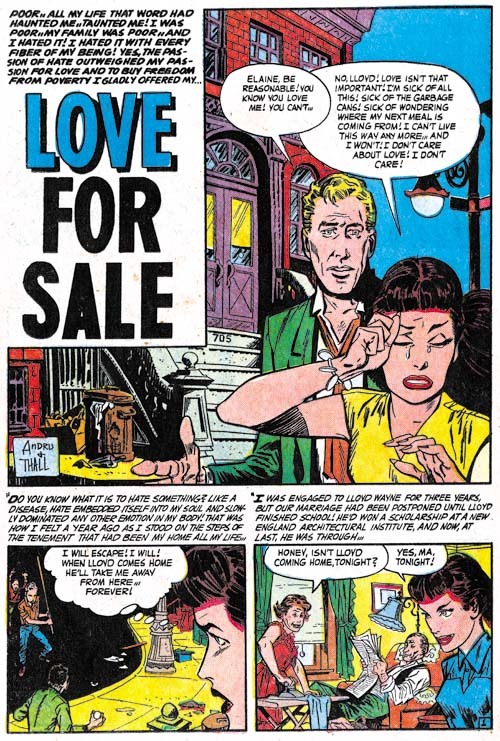 While the number of romance titles has been steady the number of publishers of romance comics has been declining (The Real Reason for the Decline of Comics). 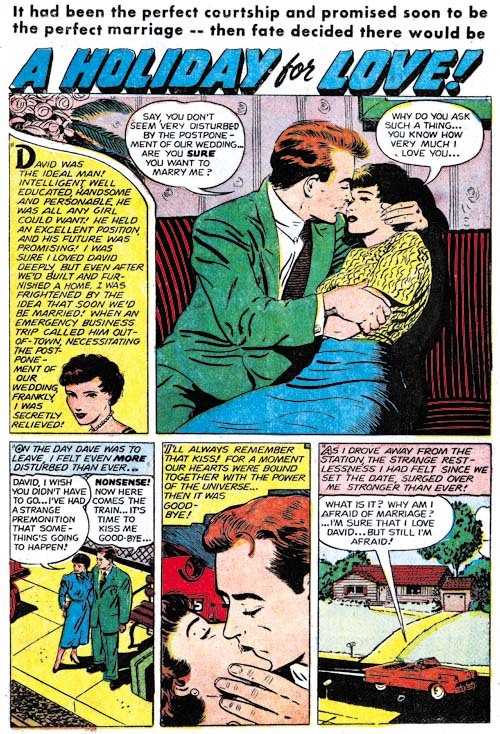 Although I describe this period as being all Kirby romances, that is not completely accurate as other artists did appear. 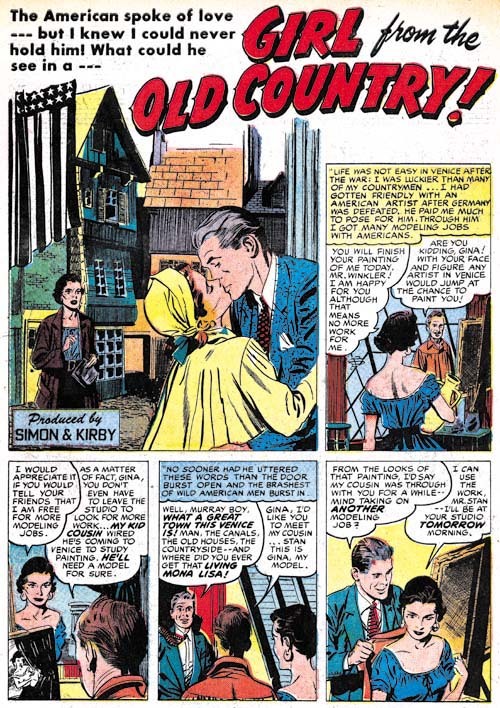 Of the six issues discussed in this chapter five were truly all Kirby while one (Young Love #71) was a more normal Simon and Kirby production. For YL #71 Kirby does the cover and one story but the three other stories were by other artists. 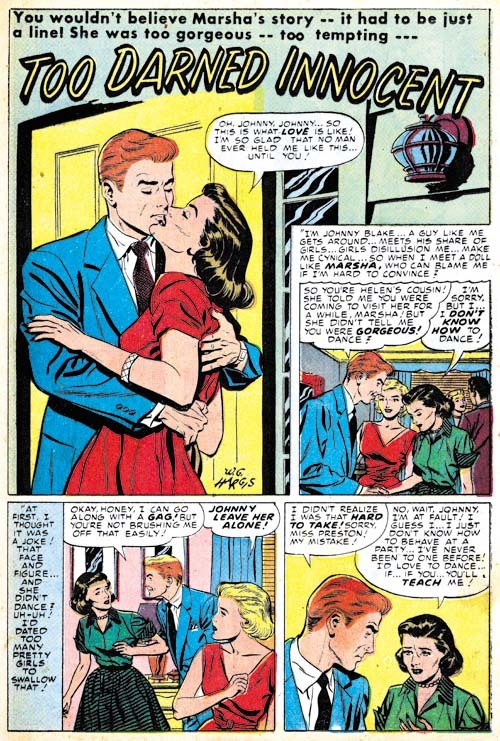 It is odd that all the artists were placed in this one issue while Young Romance #83, which came out in the same month, was all Kirby. All of the artists for YL #71 had been used prior to this year but one only in a war genre title. Therefore it is uncertain whether this was left over inventory or not. 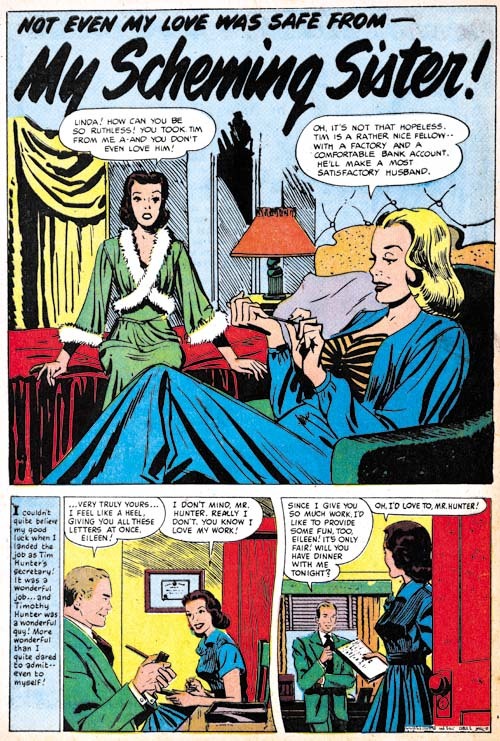 Bill Draut’s art has the somewhat cleaner look that his art showed in the last chapter. Clothing folds are smoother and more sweeping and not so blotchy as was his style previously. 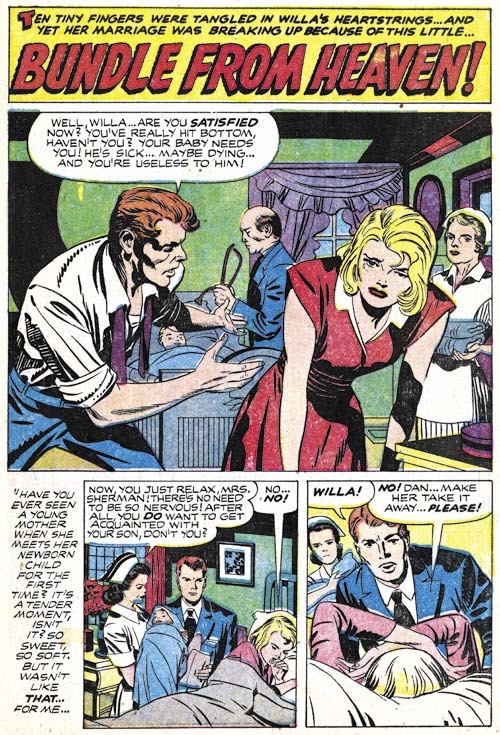 The GCD lists Bill in DC’s Tales of the Unexpected #2 (April 1956) so I wonder if this change is an attempt to change his style to one more acceptable to DC. 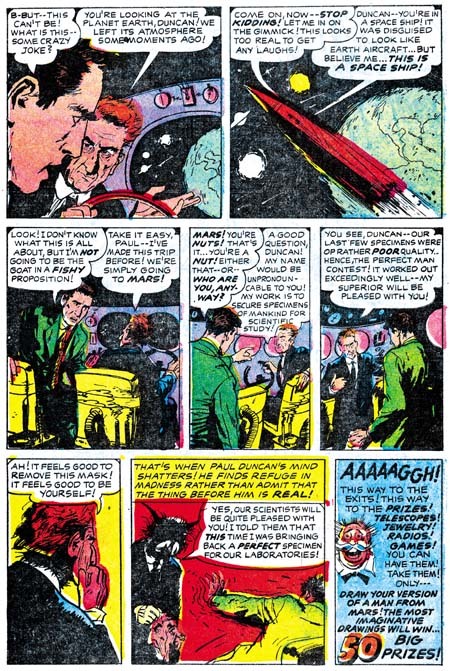 If so it is the beginning of a change that would rob Draut’s art of much of what I admire and replace it with a style that was not that much appreciated by DC or any other publisher. 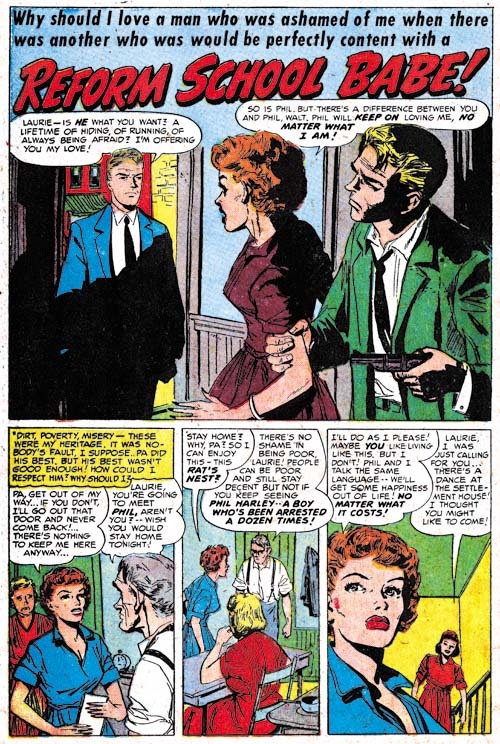 “Birthday Present” would be Ann Brewster’s last work for Simon and Kirby. 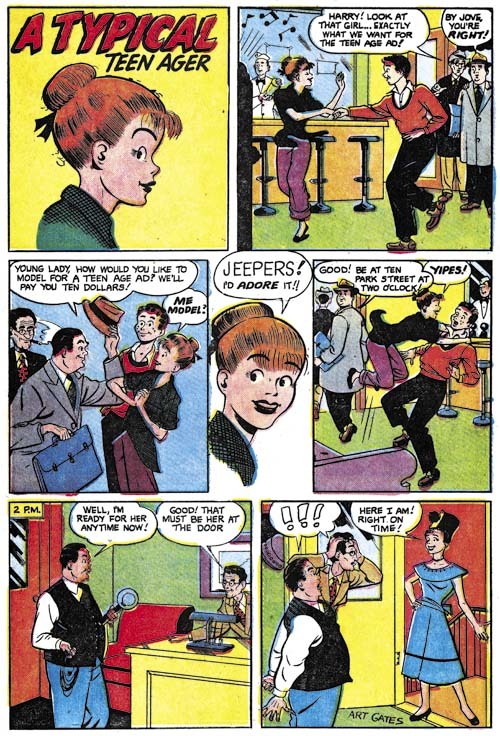 Joe and Jack only used her for the romance titles but this story does allow Ann to show how she can handle action. That she does so well with action should not come as a surprise because he she was doing superheroes earlier in her career (Ann Brewster, Not One of the Guys). 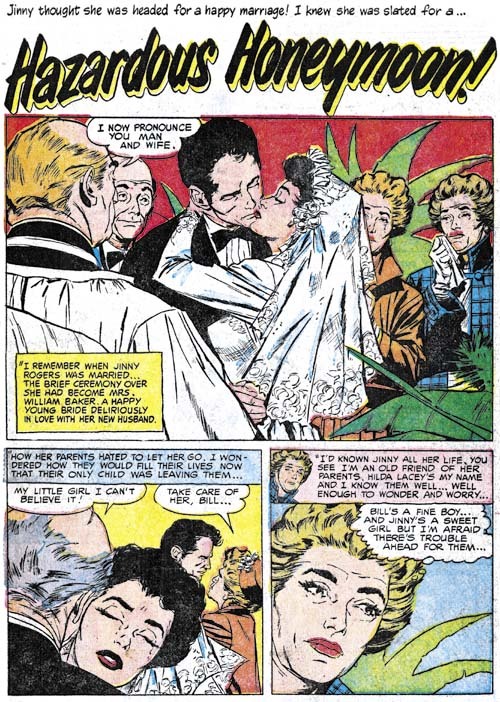 This is Ted Galindo’s first appearance in the “Art of Romance” but he did work for Simon and Kirby in Foxhole (Foxhole #4, Enter the Comic Code). Frankly the art for Foxhole was not all that great so it comes as a surprise what a wonderful job Galindo would do in “Love That Money”. We will see even more impressive work by Ted when I cover him in “Criminal Artists”, my serial post on the post S&K Prize crime titles. 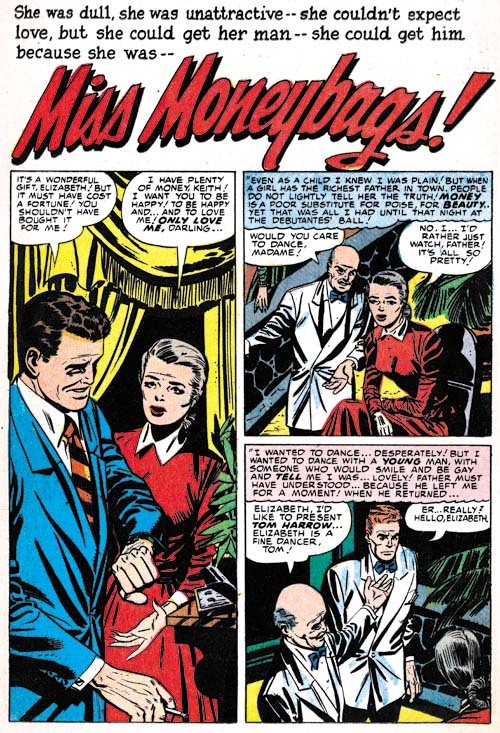 For “Love That Money” Ted’s women are beautiful and elegant and he works in a more modern comic book art style. 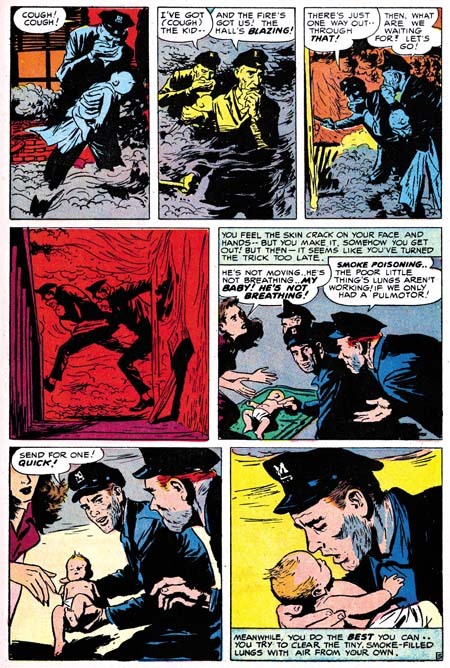 It is a shame that Simon and Kirby did not make more use of Galindo before this but perhaps they also were put off by the poorer job he did for Foxhole. 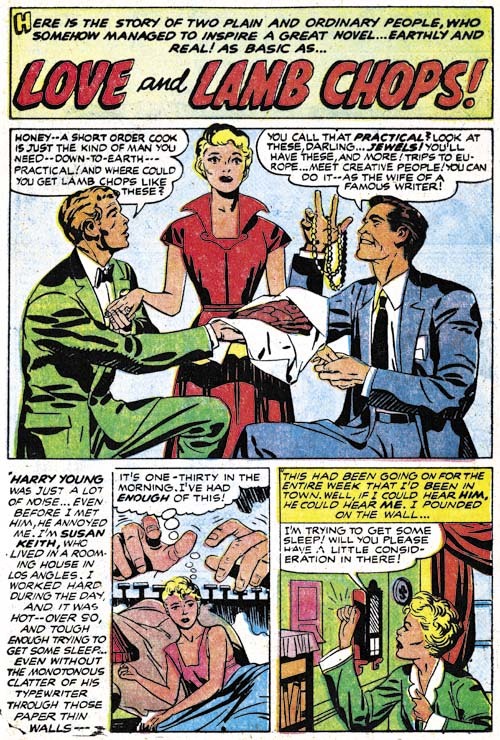 There was one other exception to the otherwise all Kirby art for this chapter besides those found in Young Love #1 and that is the cover for Young Romance #83 (June 1956). 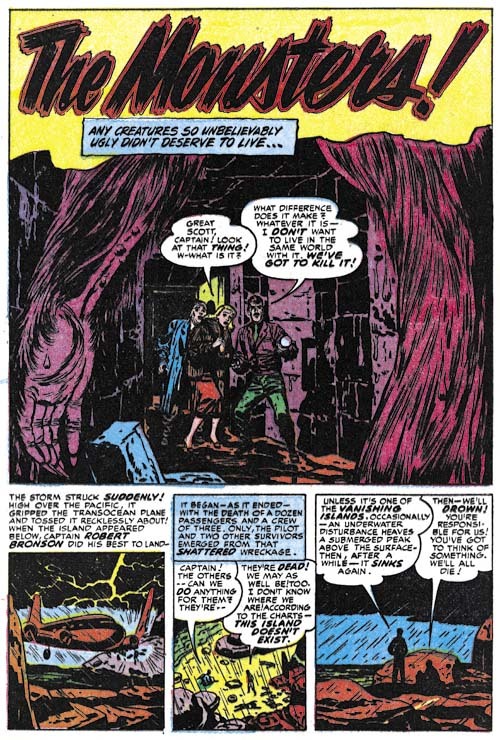 Oh that certainly is Kirby’s pencils for the foreground figures but he did not do the figures projected on the screen. The black and white art looks like the work of Joe Simon. The screen was done using special art boards that provide several degrees of tone based on chemical applied to it. Years later these boards were used by Joe and the artists working for him for work on Sick. Joe still has some of these boards and once offered to show me how they worked. Unfortunately all the required chemicals that I could find had dried up. 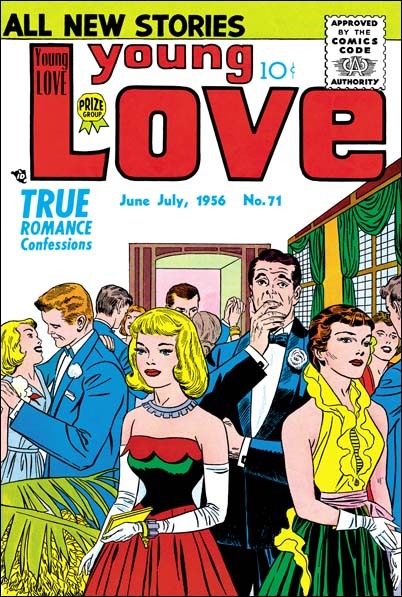 Young Love #71 provides a more typical example of a Prize romance cover than Young Romance #83. The inking for this cover was done in Austere inking style that Kirby worked in during this period (Jack Kirby’s Austere Inking). The ink lines are so fine that it would be reasonable to suggest that the work was done using a pen. 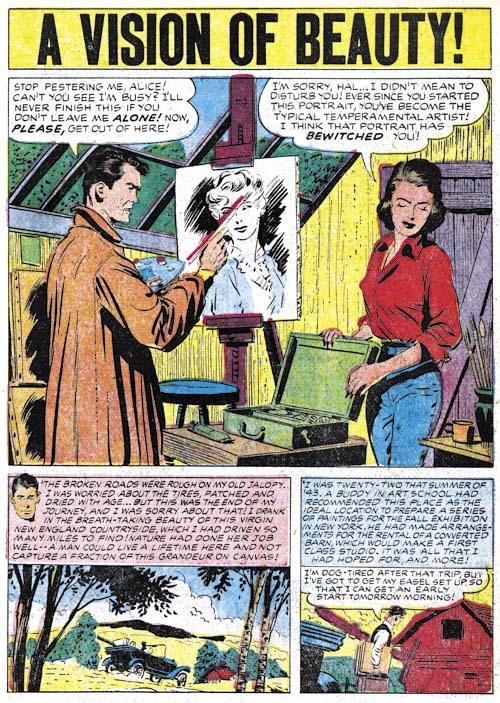 However the original art is part of Joe Simon’s collection and a close examinations shows that it was done with a brush. While story art was usually done twice up (twice the size compared to as it would be published), generally the art for the Prize covers were done at about 1 1/2 size. 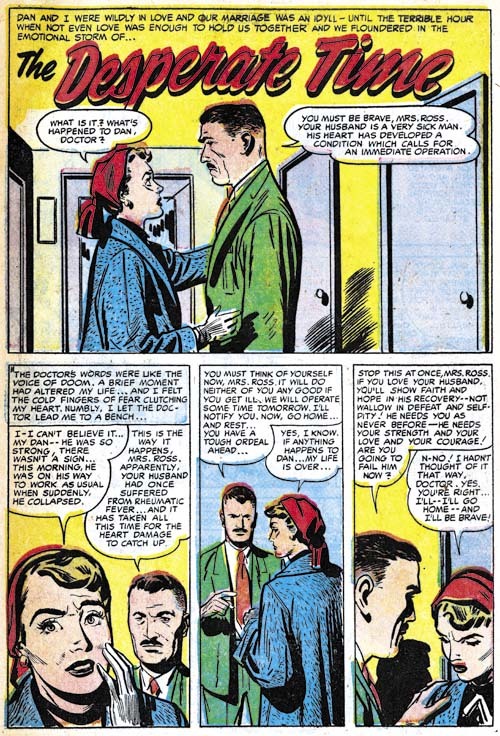 But the truly twice up size of the original art for YL #71 allowed Kirby to achieve such fine lines with a brush. 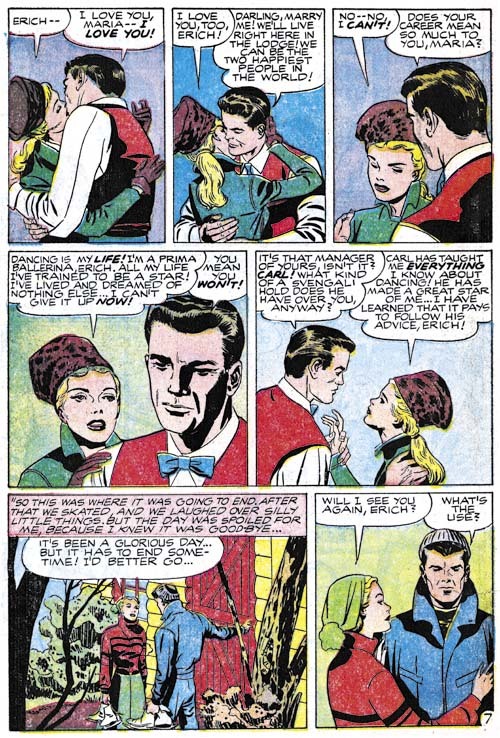 Young Romance #83 (June 1956) “Dancing Doll” page 7, pencils by Jack Kirby, inks by Jack Kirby and Marvin Stein? I find Kirby inking Kirby to be particularly interesting and therefore want to provide a number of examples below. 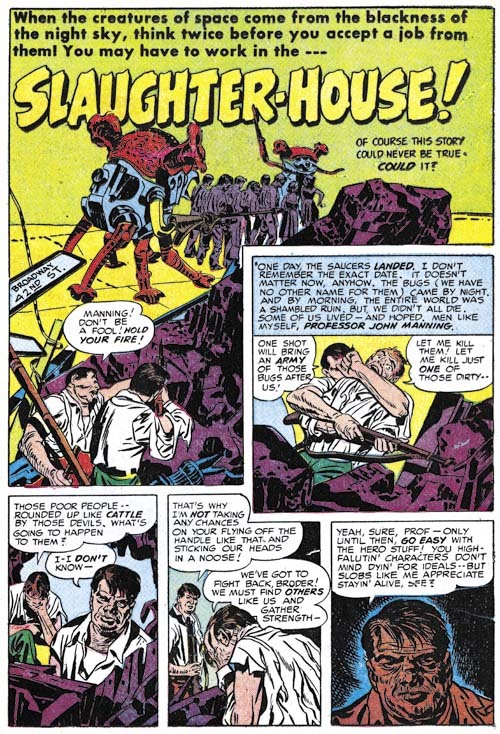 However much of the inking of Kirby’s pencils during this period was not done by Jack himself. I therefore think I would be remiss if I did not provide at least one example of Kirby inked by another artist. While the inking on “Dancing Doll” is rather nice it does have some characteristics that I believe exclude crediting it to Kirby. 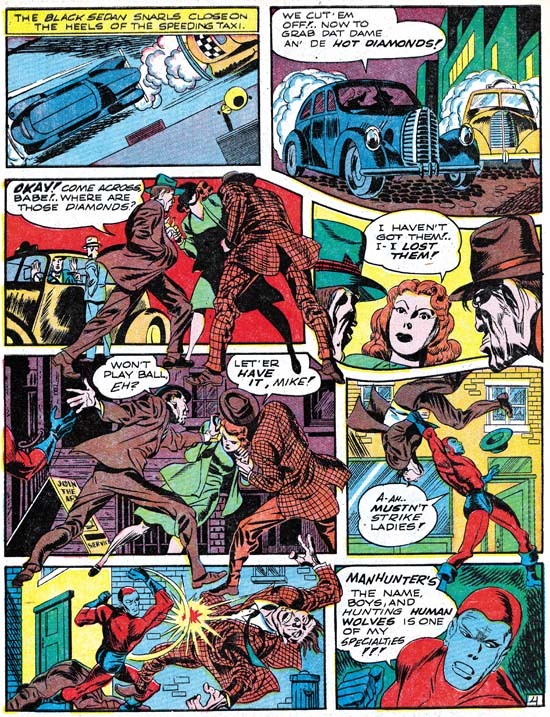 For instance, although it is hard to make out from the image I provide, the cheek of the main in panel 4 has some fine feathering that I have not seen Kirby use. Inking attributions during this period are particularly difficult. There are two leading candidates; Bill Draut and Marvin Stein. There are some examples that can be confidently attributed to each of them. But these are the exceptions and in most cases it is hard to tell if one of them inked it or some unidentified artist. “Dancing Doll is just such an example. 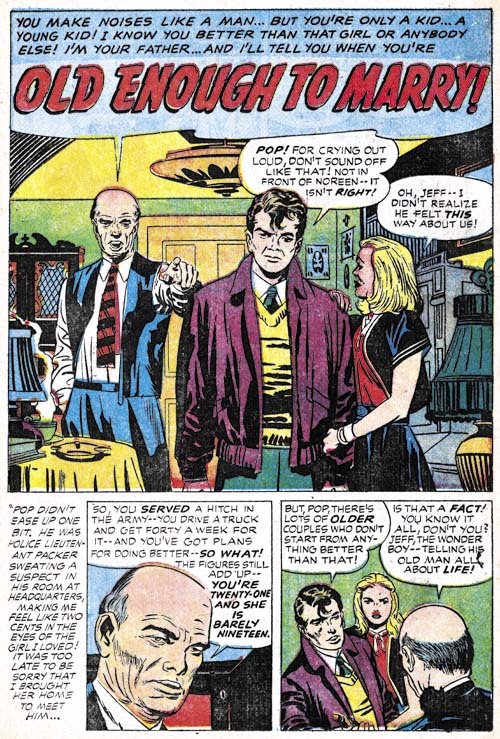 However the way the inking is done around the mouth of the man in panel 4 suggests to me it might have been done by Marvin Stein. Some of the work from this period appears to be a combination of inking by Jack himself and some other artist. This is true for “The Serious Type” with the other inker questionably identified as Marvin Stein. However the work on the splash page appears to me to be inked by Kirby alone. 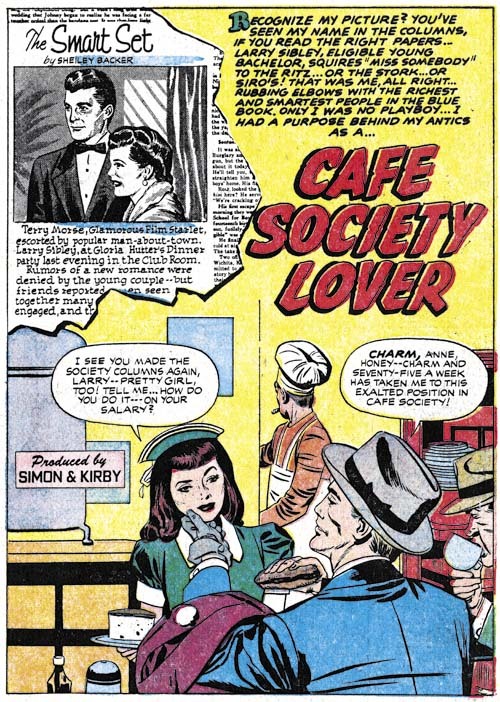 Note the simple, spatulate forms that the clothing folds on the waitress in the splash and the shoulder blots throughout. 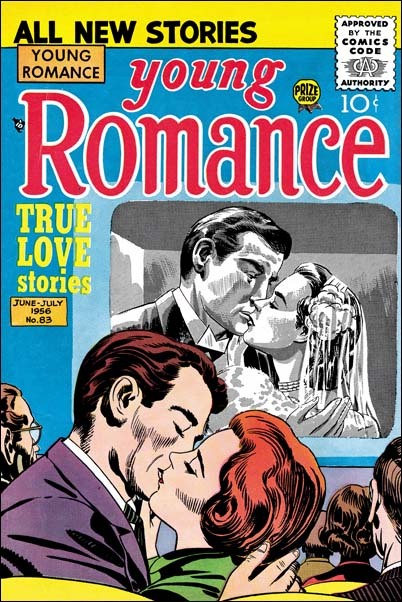 Admittedly not the most exciting splash, even by standards of the romance genre, but still a well executed piece. 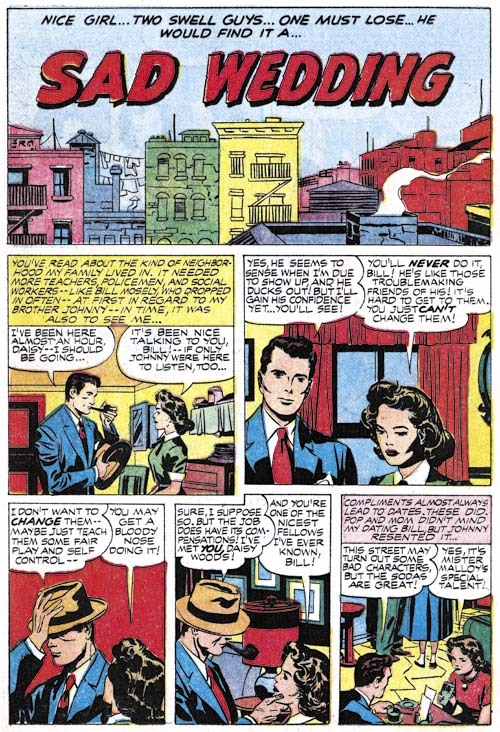 “Under New Management” is another jointly inked work and again by Kirby and possibly Stein. 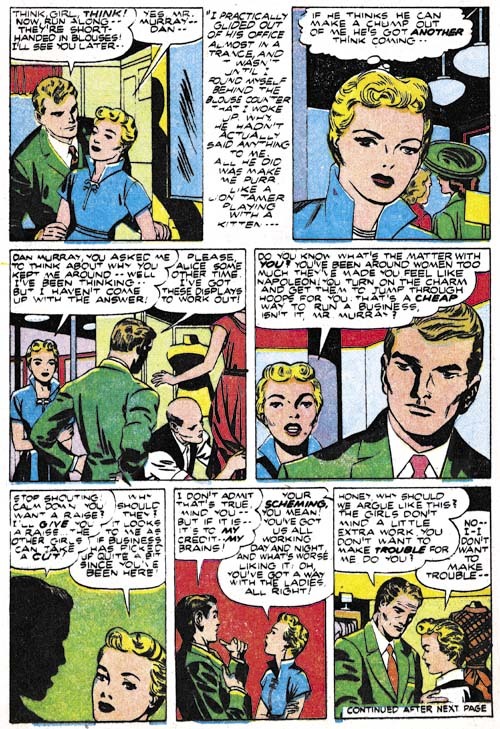 This seems to be a case of inkers working on particular pages; Kirby on pages 2 to 4 and 7 with Stein doing pages 1, 5 and 6. Besides the simply shaped clothing folds and shoulder blots there are also a couple of abstract arch shadows (panels 1 and 4). 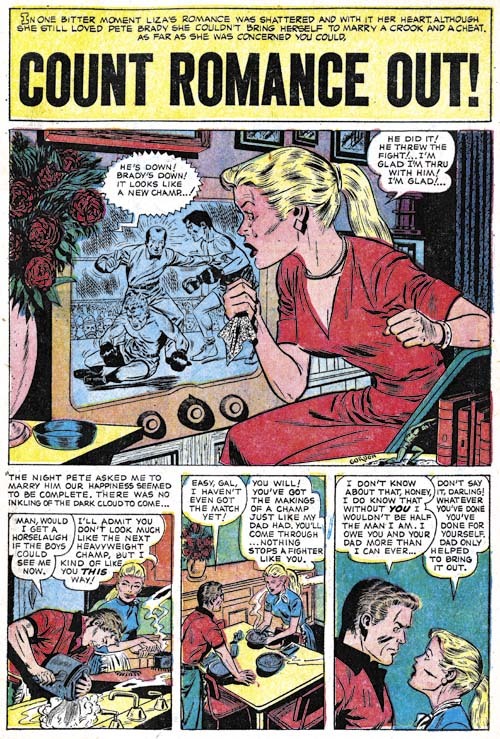 These are all typical of Kirby’s inking although Joe Simon used these techniques as well. 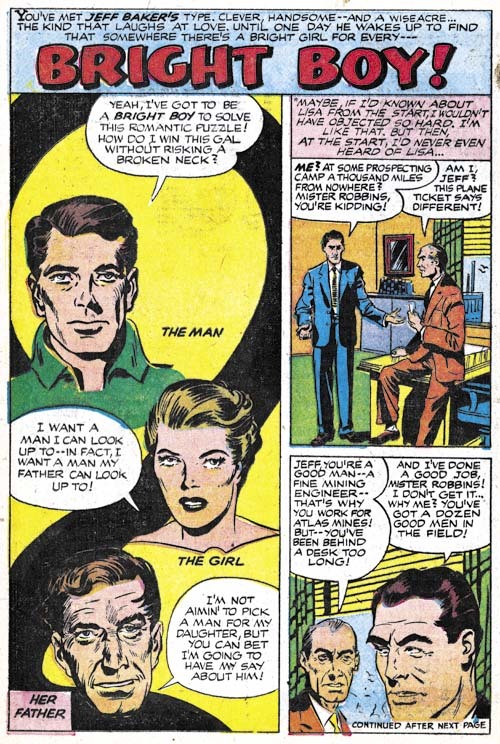 I feel it fair to point out that I am a bit uncertain about whether Kirby inked the nose and eyebrows of the man in panel 4. I believe that all of the “New Boy In Town” was inked by Jack himself. Again while I cannot fault his drawing or inking it is not one of his more exciting splashes. The same theme is covered in a much more interesting manner on the cover. 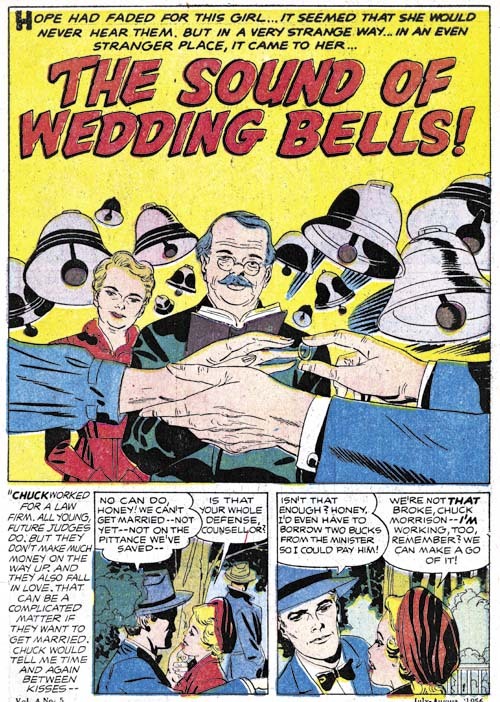 Only the wedding couple’s hands are shown in the foreground. Behind their hands are the man presiding over the ceremony (a judge?) and a witness. The background is filled with clamoring bells announcing the festive occasion. This is certainly the most interesting romance splash Kirby has done during this period. 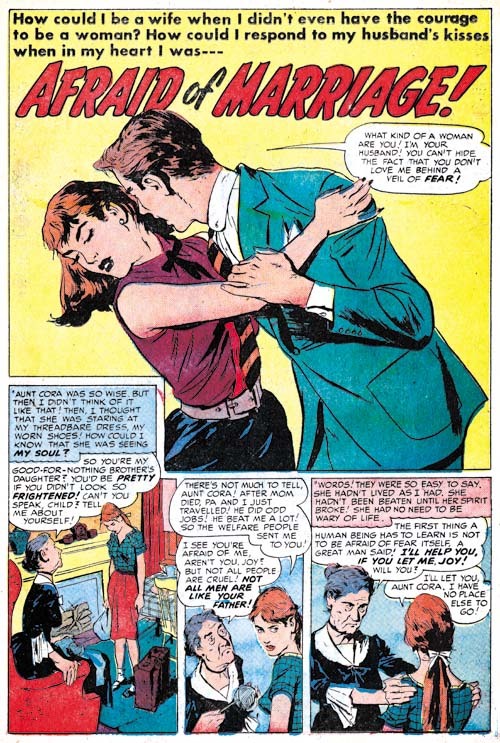 Still more all-Kirby romance comics to come in the next chapter of The Art of Romance. 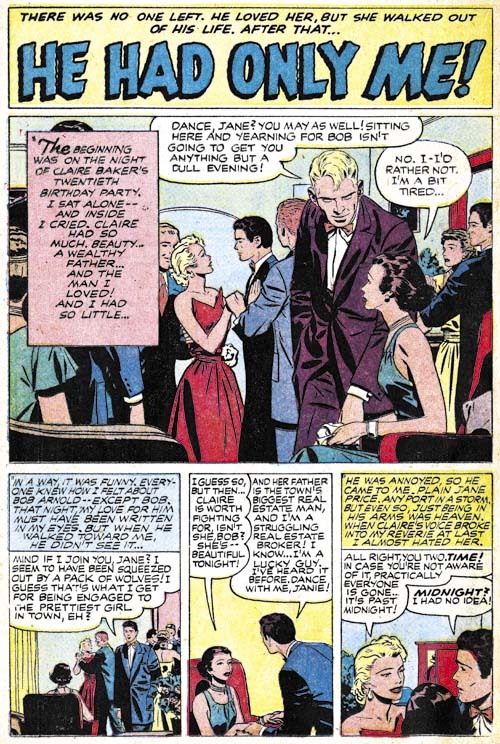 As discussed in the last chapter (Chapter 30), the three Prize romance titles would be almost entirely drawn by Jack Kirby. 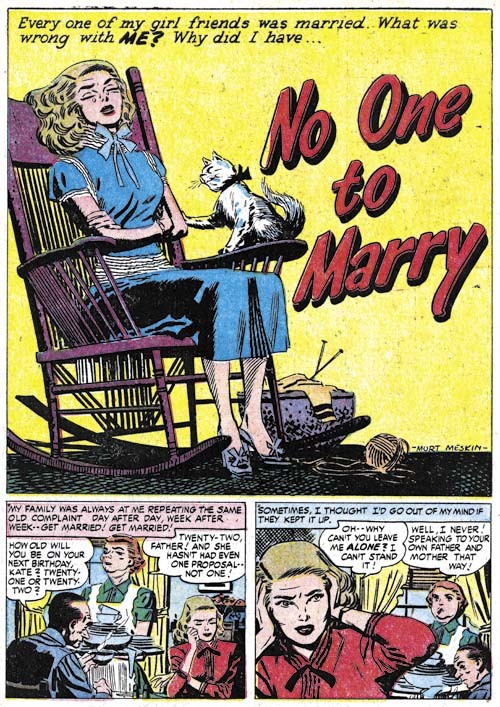 There are only two exceptions one being “He Had Only Me” by Bill Draut from Young Romance #81 (February 1956). Bill’s drawing style does not seem to differ from what we have seen in his previous work but his inking does reserve comment. Typically in the past Bill inked clothing folds in a rather blotchy manner. Here however is spotting is much smoother. 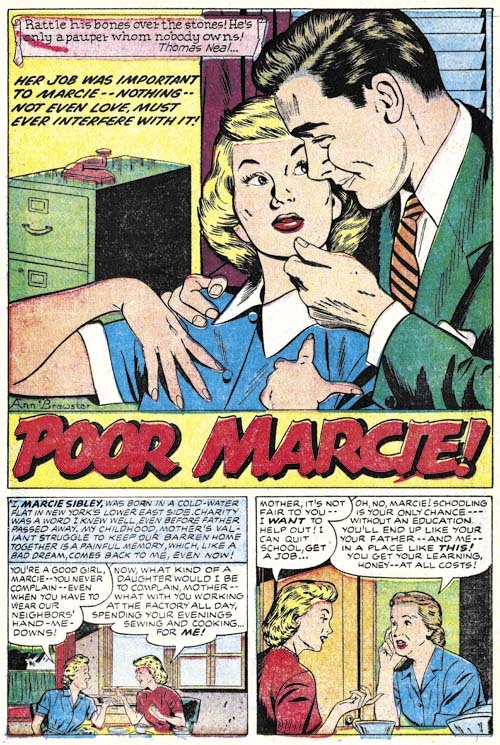 This makes his brush techniques more similar to those of Marvin Stein. 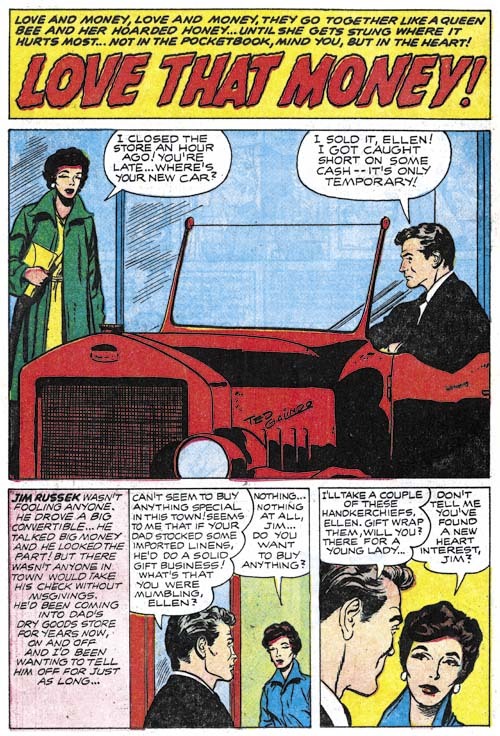 While there is little reason to believe that Stein was inking Draut’s pencils it does present a problem when trying to indentify either of those artists as an inker to Kirby pencils during this period. 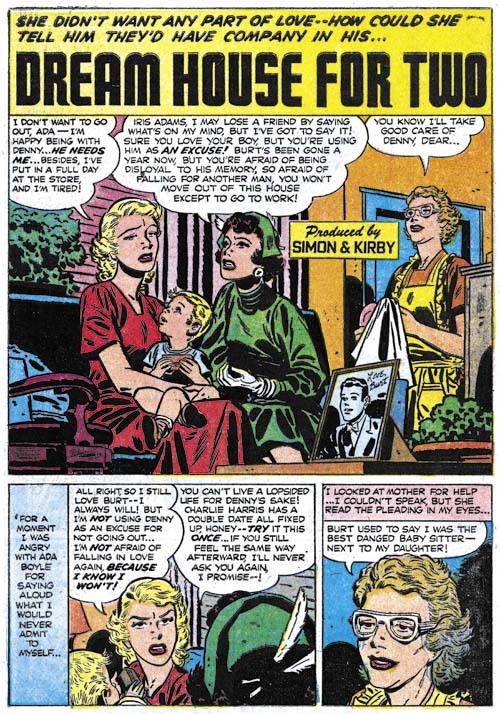 The other non-Kirby story from this period was “Bright Boy” by Bob McCarty. Like the one by Draut, this story was also has a February cover date suggesting that the two pieces were leftover from before the switch to all Kirby art. Previously McCarty’s art had become very similar to that done by John Prentice but here he reverts to a style more like his older one. 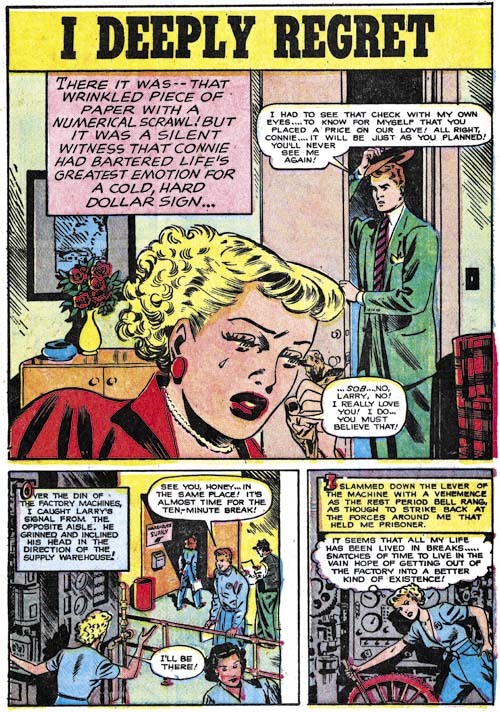 Young Love #70 (April 1956) “A Week in Frisco”, pencils by Jack Kirby, inks by Bill Draut? Much of the inking of Kirby’s pencils during this period were done by Jack himself, but not all. 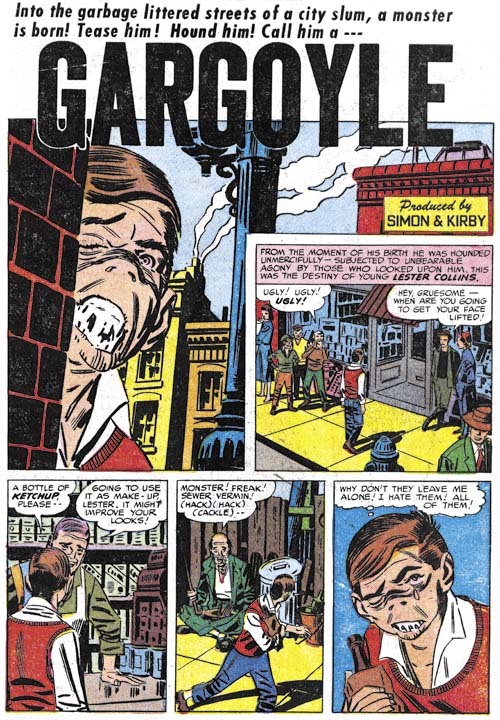 It is hard to be certain who were the inkers that Kirby used but there are two most probably candidates: Bill Draut and Marvin Stein. 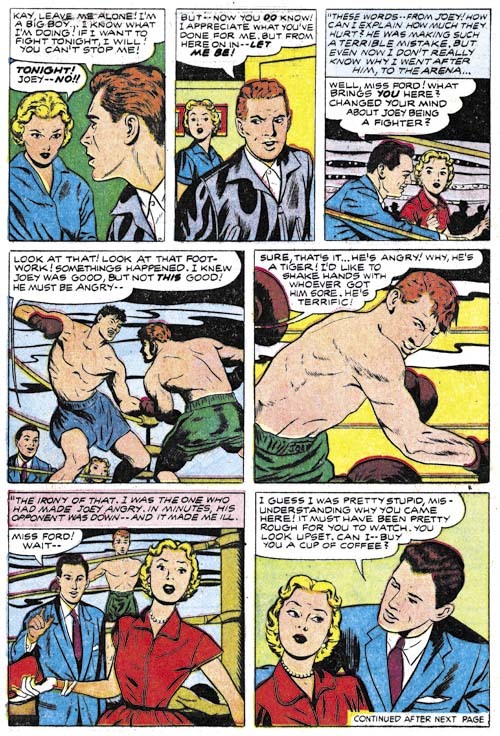 Unfortunately as we say about in the story that Draut drew himself (“He Had Only Me”) that Bill had converted to a cleaner, less blotchy brush style at least some of the time. The inking of the splash for “A Week in Frisco” shows thicker type of clothing folds that I normally associate with Draut and therefore I tentatively credit it to him. 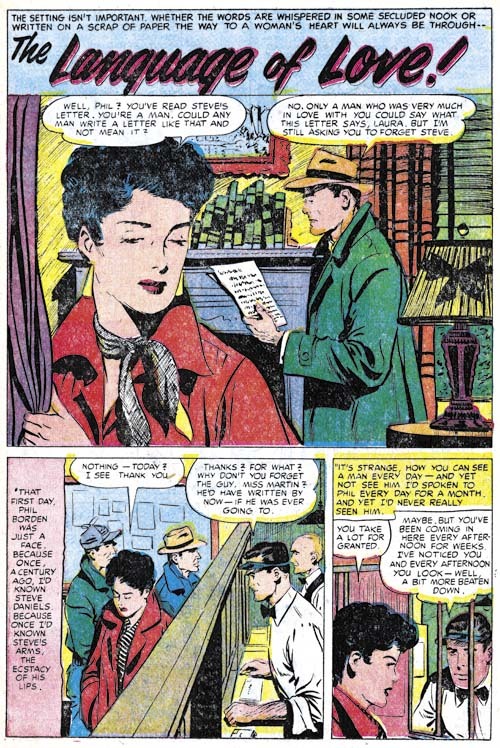 The Kirby’s Austere style of inking is characterized by an overall lighter spotting. Older techniques like picket fence crosshatching or drop strings (Inking Glossary) are used sparingly if at all. When larger dark areas are required they are made by flooding the region with ink. Page 3 from “The Lady and the Truck Driver” is a good example of Austere inking. 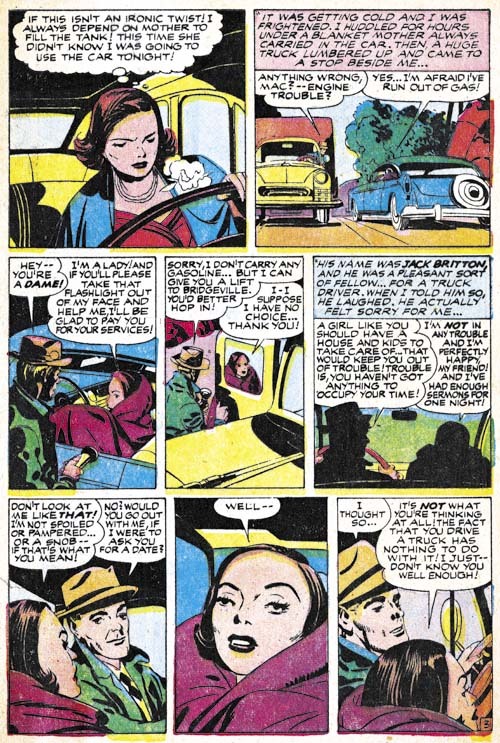 However the real reason I choose this page is because of the delightful portrayal of the lady especially in panel 7. 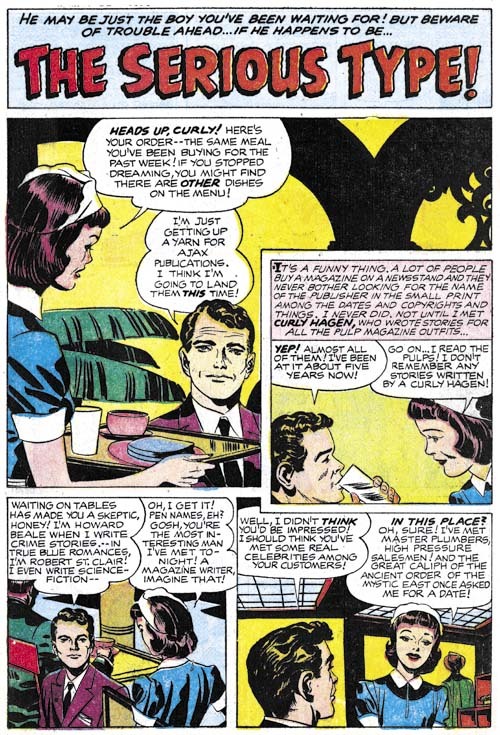 I just do not understand why people keep saying Kirby could not draw beautiful women! 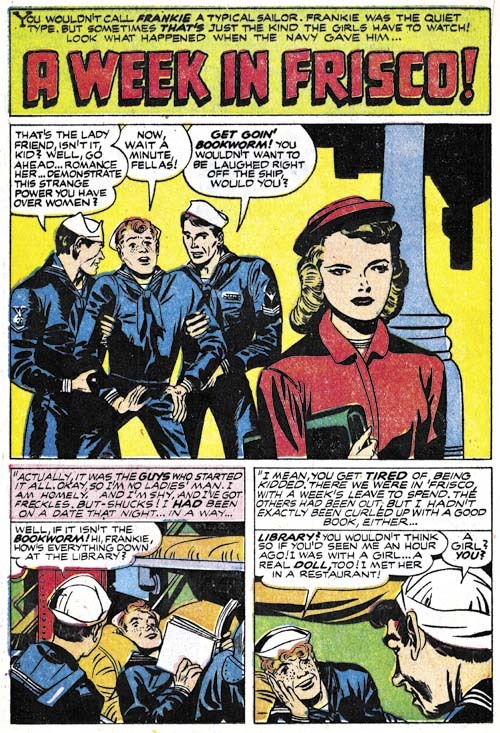 Actually I think I do understand why people continue to make the claim that Kirby could not draw beautiful women. 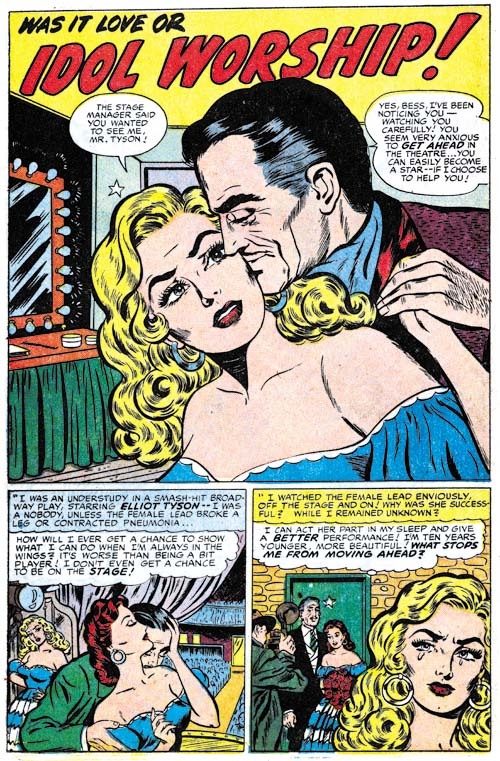 In my opinion the reason is that Kirby never quite bought into what I call the Barbie look that so dominated romance art starting from the late 50’s. So many artists seem to try to draw women as attractively as possible but ended drawing females that were indistinguishable except by hair style and coloring. 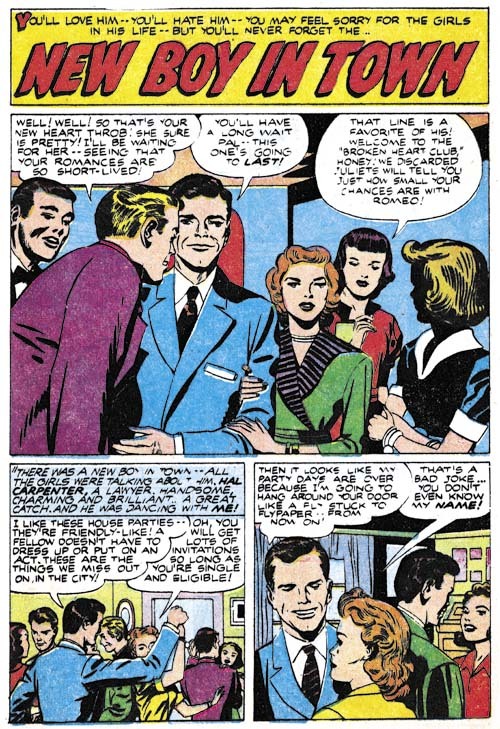 At least while doing romance for Prize, Kirby would try to give all the lady protagonists individual characteristics that were appropriate for whatever story he was drawing even if that meant that this might detract a little from their beauty. Sometimes Jack even managed to combine individuality and beauty as for example in “Bundle from Heaven”. Despite her haggard look would anyone doubt that the lady in the splash was anything but beautiful? Frankly I do not believe any inker other than Kirby himself would successfully achieved this nuance depiction. While Kirby began to adopt the Austere inking style it was by no means a sudden switch. I would not hesitate to describe the above splash as Austere style inking and yet look at the man’s shirt with its picket fence crosshatching and drop string. 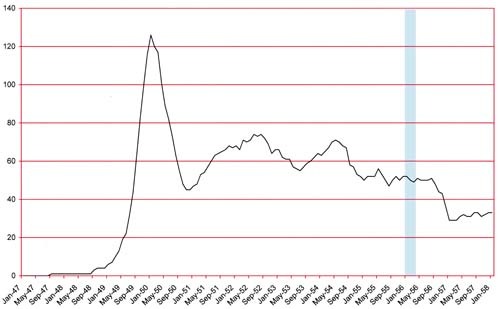 Such holdovers from the older Studio style inking were still present but would become much more infrequent in the months to come. Decisions, decisions, decisions! Lamb chops or jewelry, what is a woman to choose? Comic book stories were always meant to be a little over the top but this splash is just hilarious. But I kind of suspect that Jack knew that as well. I am really not completely certain that Jack inked the splash but I suspect so since he provided the spotting for the rest of the story. Such a simple splash is rather unusual for Jack who preferred scenes where people were prominent. Perhaps the splash appeals to me because the scene it portrays can still be found in Manhattan including my neighborhood. I am sure that had Kirby chosen to show the street level what we would see would hardly be mistaken for a more modern local but this higher viewpoint shows the architecture that has not changed much in many places. The only thing to give its age away are the clothes hanging of the lines. In the comments to Chapter 30 Ger Apeldoorn remark on a story that I did not include in my post, “The Day I Grew Up”. My neglect was not intentional as I originally planned to discuss it. It may seem strange to some that such a minor artist should be singled out. 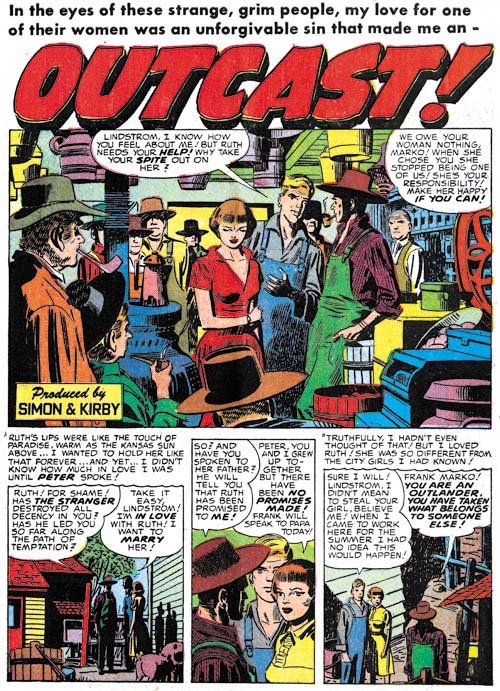 After all I have not covered every artist who worked for Simon and Kirby during this period and most of them were much more talented than this one. This artist admittedly crude drawings do have a very Kirby look to them, which can be particularly be seen in the final panel for page 3. 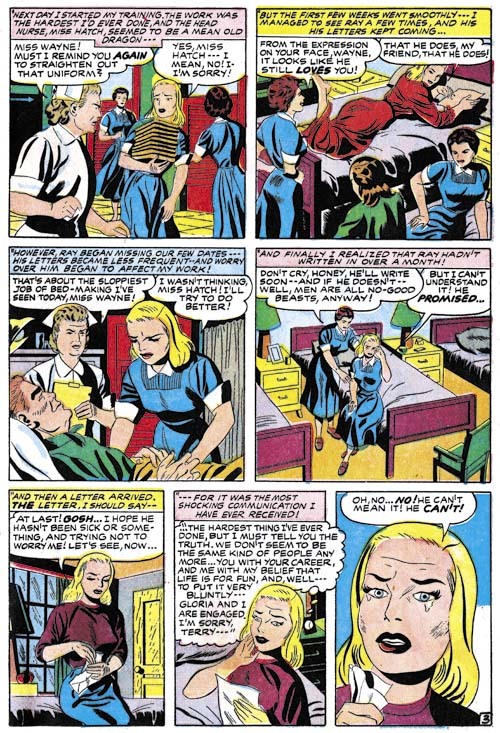 The similarity to Kirby’s work extends beyond the style used to draw the characters but includes a similarity to Jack’s way of graphically telling the story. Among these are the use of viewing angles, the shifting viewing distance, depth of field, and a similar use of perspective. This similarities could be explain as Kirby layouts, imitation, or swiping. While an imitator might copy some aspects of another artist’s style it is unlikely that he would pick all these mannerisms. Nor would a swiper be expected to be able to combine multiple sources into such a coherent whole. This leaves as the most likely conclusion that Kirby supplied layouts. 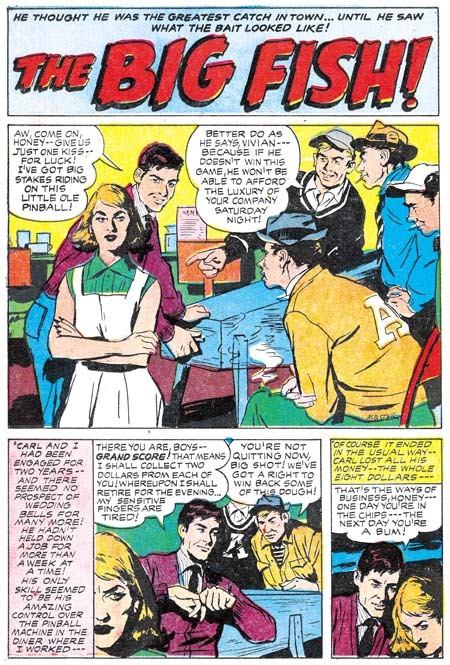 While this seems the best explanation it is remarkable that Jack would supply layouts to such an untalented artist when he (Kirby) was doing so little artwork. Posted February 18, 2007 in 2007/02, 6 Mainline, Featured Work, Periods, Prize, Topic, z Archive. Another great FA cover done during the period when this title was more about humor then about being the typical superhero. 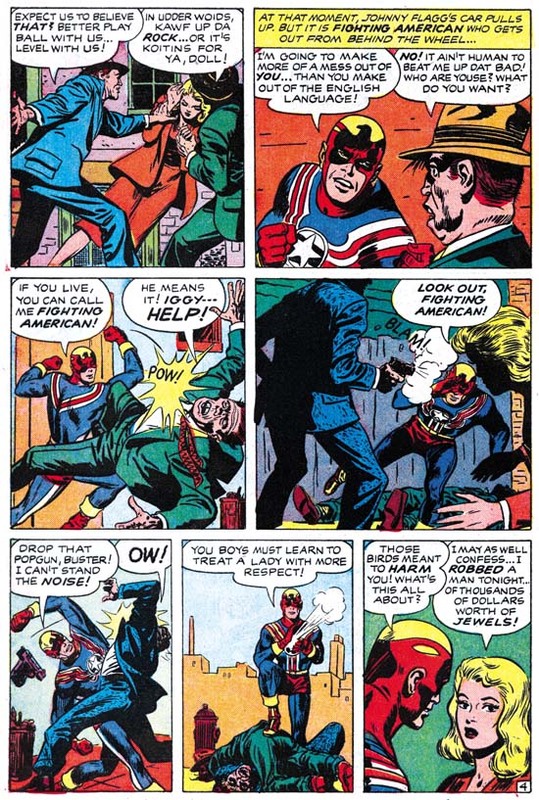 In common with the cover for Fighting American #3 we find our hero about to spring a surprise on his clueless foes. I love the line “let me kill Speedboy just this once”. It is a great cover filled with Kirby’s unique humor touches such as the absurdity of Rhode Island Red lighting her cigar with a torch. I find that Jack had his own way of humor which includes the physical appearance of the subjects. To me it is very different then what Joe Simon did for the covers of Sick. 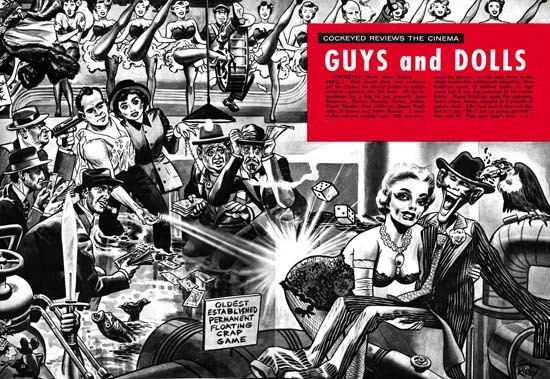 It is also why I am always surprised that many still think that Guys and Dolls was done by Jack when its visual humor is so much like Joe’s. I am rather surprised about the green face that the colorist provided for Yuscha Liffso. It makes him look not so much funny as weird. I guess it is the only thing about the cover that I find objectionable. There were three more issues to Fighting American, not including the Harvey issue. Unfortunately these later covers just do not have the “punch” found on the first four issues. These last issues came out at the same time as the Mainline titles so I suspect Jack’s creative energies were going there instead. Posted July 20, 2006 in 2006/07, 4 DC (early), 6 Mainline, 7 Freelance, Harvey, Periods, Prize, Serial Posts, z Archive. 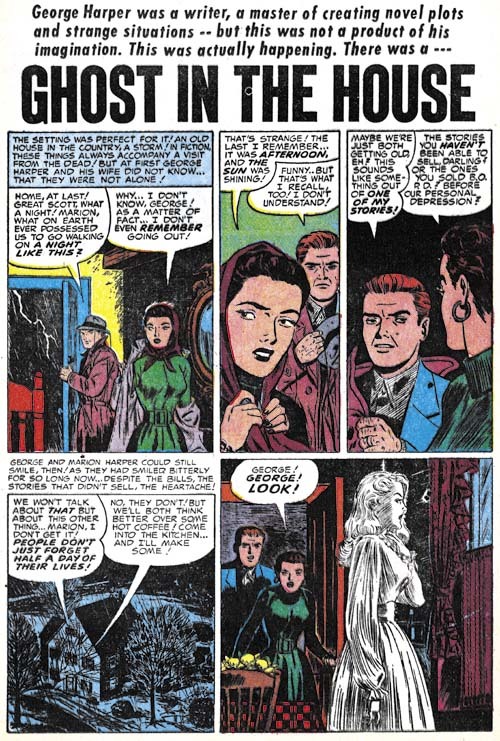 After “48 Famous Americans” S&K entered a period of abundant work mainly producing crime, horror and romance genre comics. As far as I can tell, Joe did not pencil anything during this period. I say that rather hesitantly. 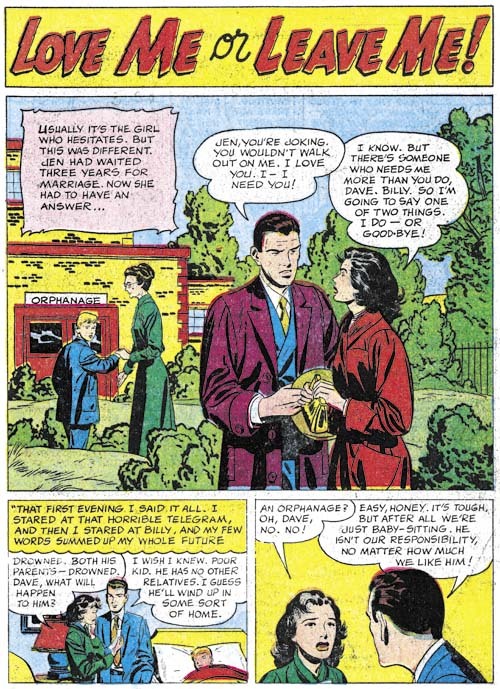 While working on my serial post “The End of Simon and Kirby” I reexamined a lot of S&K material. 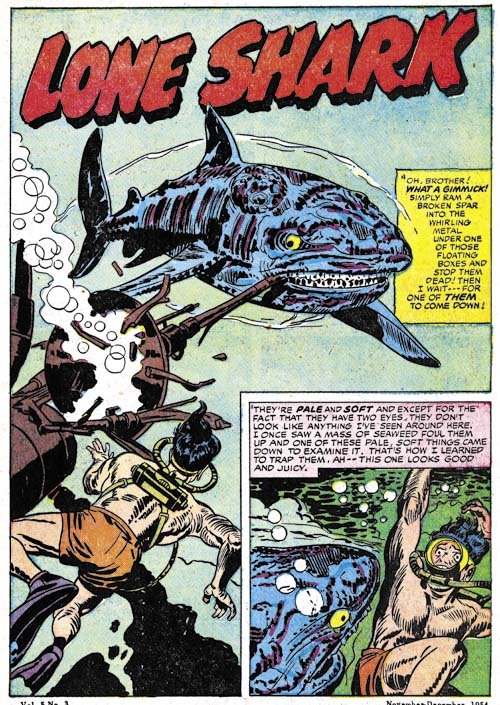 Suddenly I realize one story that I always thought as drawn by Kirby and was listed in the Jack Kirby Checklist had actually been done by Joe Simon. It seemed pretty obvious and I was quite surprised that I did not notice it before. I will discuss this story below but the point is if I had missed that work by Simon I might have missed others. 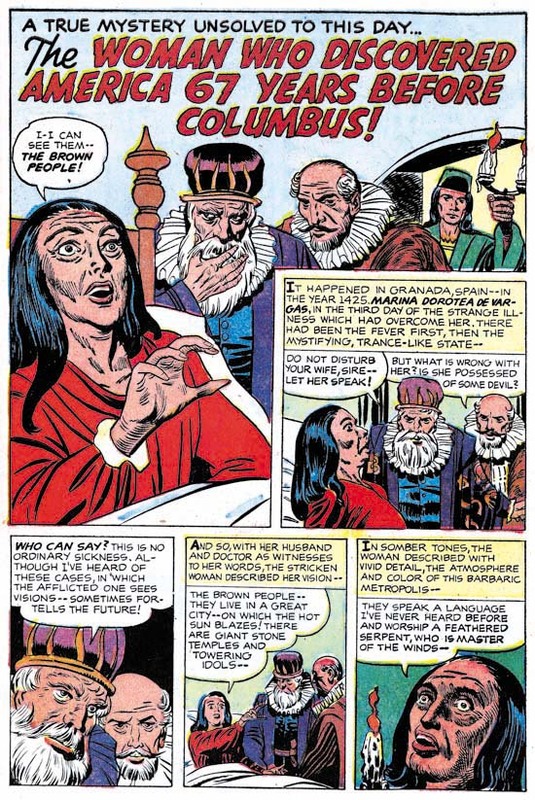 When we approach the end of the Simon and Kirby collaboration, work penciled by Joe reappears. However in some cases saying Joe is the artist depends on you think what makes someone the creator of a piece. 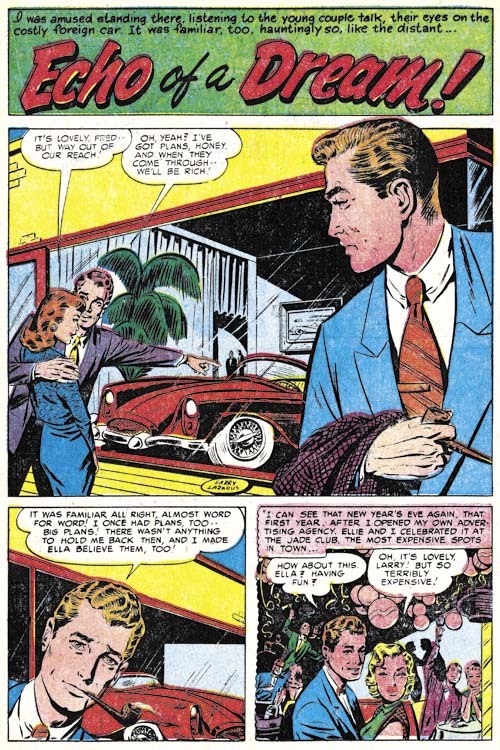 In his book “The Comic Book Makers” Joe describes an incident where S&K got caught by Prize for reusing old romance art with new scripting. So far I have not found the stories that Joe is talking about. 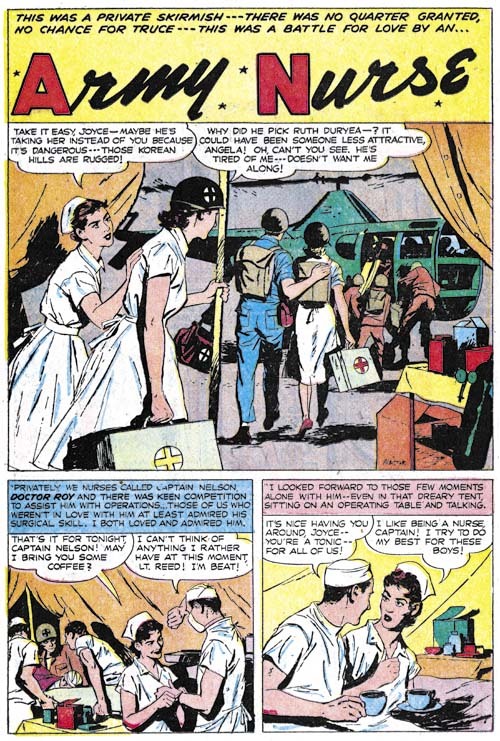 But in Fighting American #6 (February 1955) there is a story “Deadly Doolittle” that clearly was redone from “Beware of Mr. Meek” a Manhunter story from Adventure #75 (June 1942). But the FA story was not made by reworking stats from the older comic to change the uniforms, rather the entire story was redrawn. 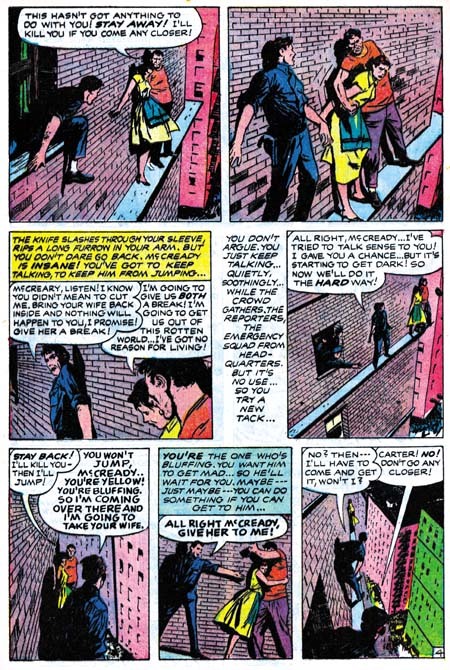 Much of this was done to remove some older layout techniques that Simon and Kirby no longer used. Early in their collaboration parts of figures would frequently extend well beyond the panel edges entering other panels. The FA story was redrawn so that things remained in their panels. 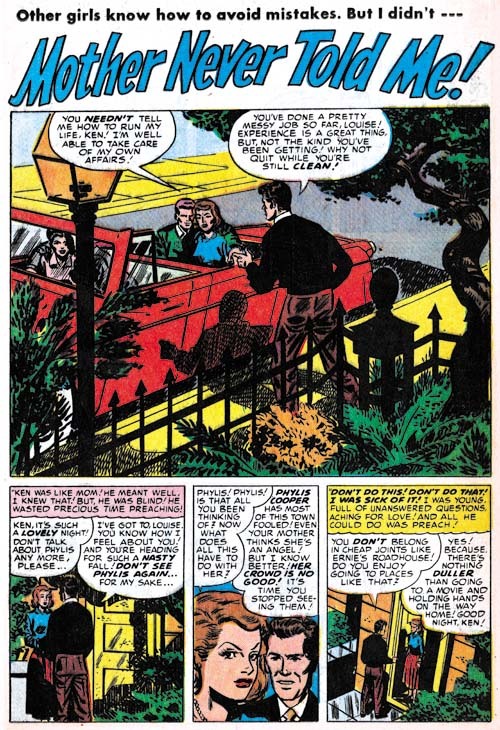 But this was not done by just eliminating the parts outside of the original panels but by recomposing the panel instead. I find Simon’s touch in all of this work. It is particularly interesting to see Joe redo some of Jack’s classic socko punches. Joe tries valiantly but does not quite succeed in capturing Jack’s effect. 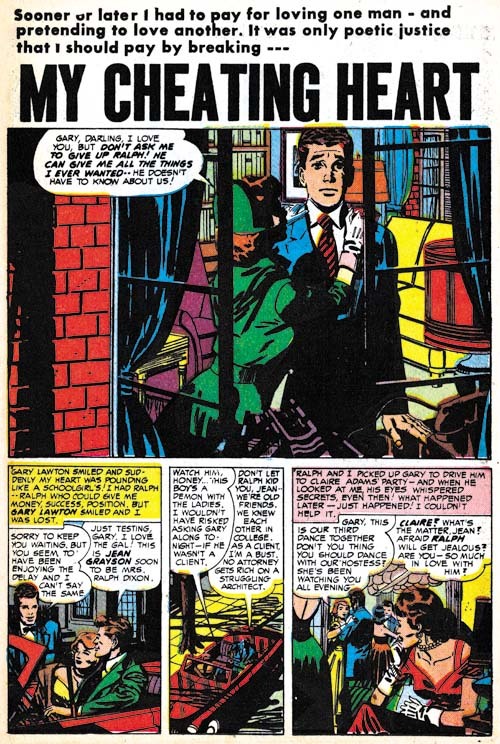 I find a lot of Simon touch in this story and all the Kirby effects seem to be transmitted through Joe’s sensibilities. The last piece of worked signed jointly as Simon and Kirby is the unusual “Guys and Dolls” that appeared in the Mad-takeoff Cockeyed #4 (April 1956). 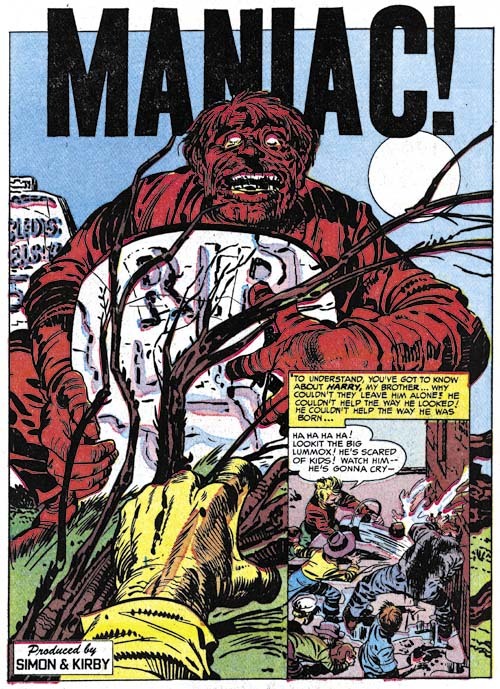 This is included in the Jack Kirby Checklist, although I really cannot say why. The art looks much closer to cover work that Joe would do later for Sick then anything I have seen Jack do. Further the visual humor looks like Joe’s and does not seem to match Jack’s humor work. For me the most convincing evidence is that this works appears to have been done with an air brush. Joe Simon was a master with this tool having learned it while working for a newspaper at the beginning of his career. He would return to using it for not only the Sick covers but also for some of his advertisement work. I have seen nothing that indicates Jack had done any air brush art. 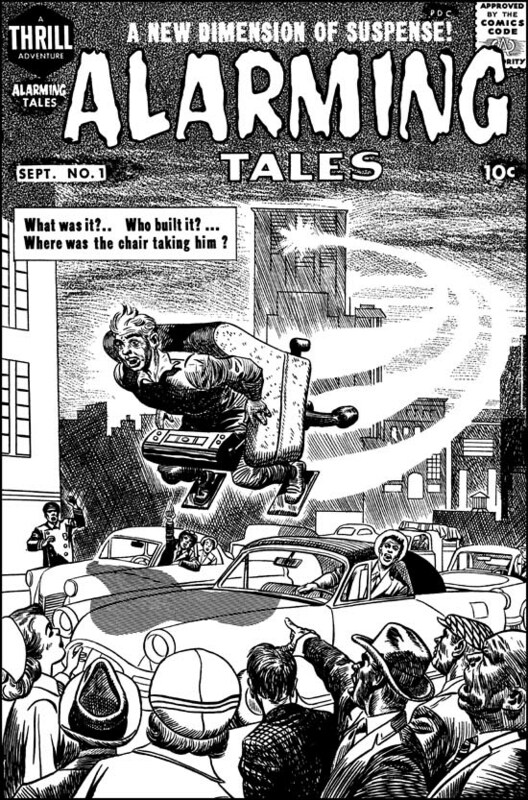 I doubt many would say that the figure in the flying chair and the background from the cover of Alarming Tales #1 (September 1957) were done by Jack Kirby. I clearly see Joe’s touch and believe he did this cover. But I can see why many see Kirby’s presence in the bottom part of the cover. I feel Joe did this portion also but he is swiping or mimicking Jack for parts of it. I presented a color image in a chapter of the “End of Simon and Kirby”. But the coloring makes it difficult to clearly see the figures, so above I provide a restoration of the line art. To me the lady on the left and the man looking out of his car seem to a have Kirby look to them. But the man pointing (third from right) and the man on the far right look more like the work of Simon. 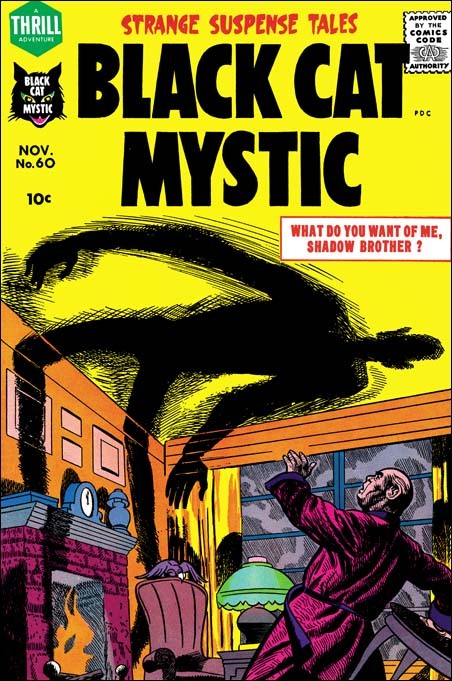 Not long after Alarming Tales #1, Joe did a cover for Black Cat Mystic #60 (November 1957). Notice the similarity of the man with the two from the AT #1 cover. 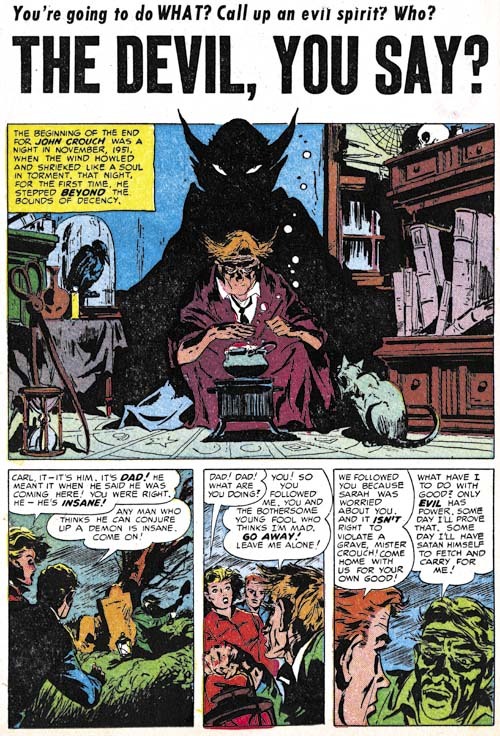 Black Cat Mystic #60 has the story drawn by Joe Simon that I mentioned at the beginning of this post. 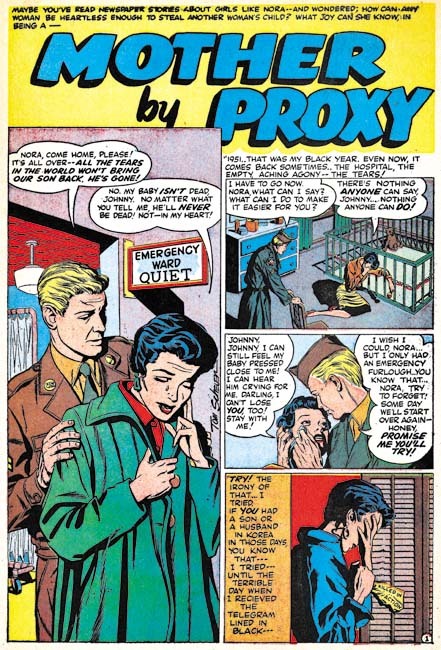 This short (2 pages) story is listed in the Jack Kirby Checklist, but as I said I now disagree with that attribution. We have in this work Joe mimicking Jack quite successfully. The men have a Kirby-ish look but a careful examination of the eyebrows reveal the more simple form that Simon preferred. The woman also comes from a Kirby source, such as some of the unused covers for Black Magic #1. But the woman’s eyes give away the fact that this was Joe’s pencil work. 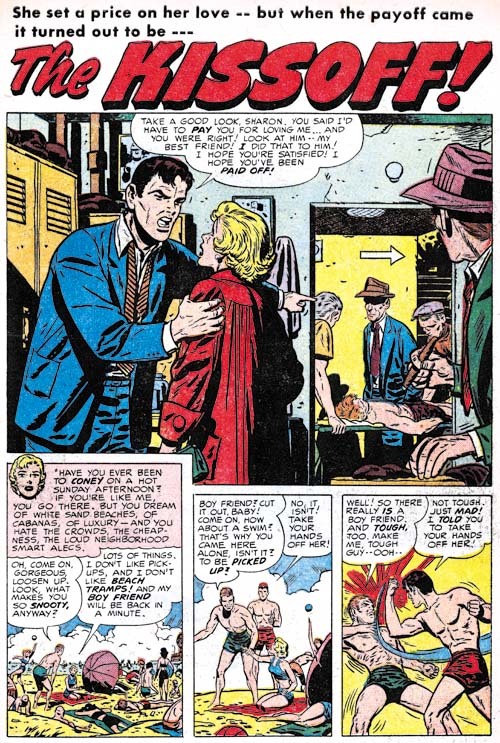 The hand of the woman in the splash panel is not drawn the way that Kirby would have done it. 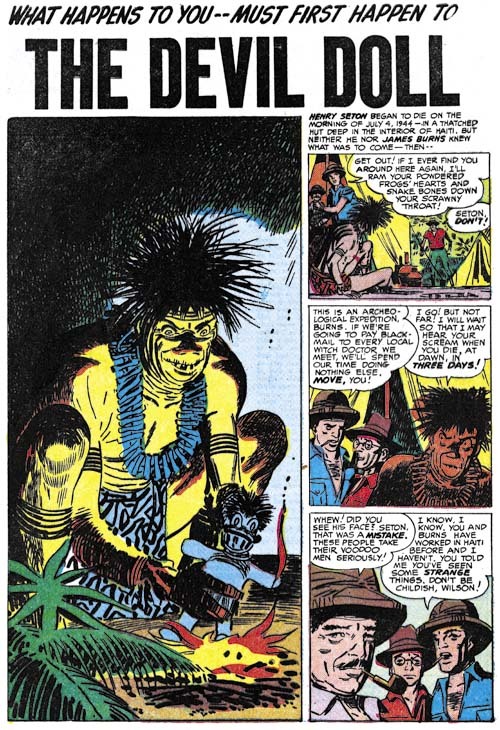 I am sure some will say that some panels of the second page of the Mayans were done by Jack. But I suspect even this includes subjects that were drawn from art history sources that both Joe and Jack used. 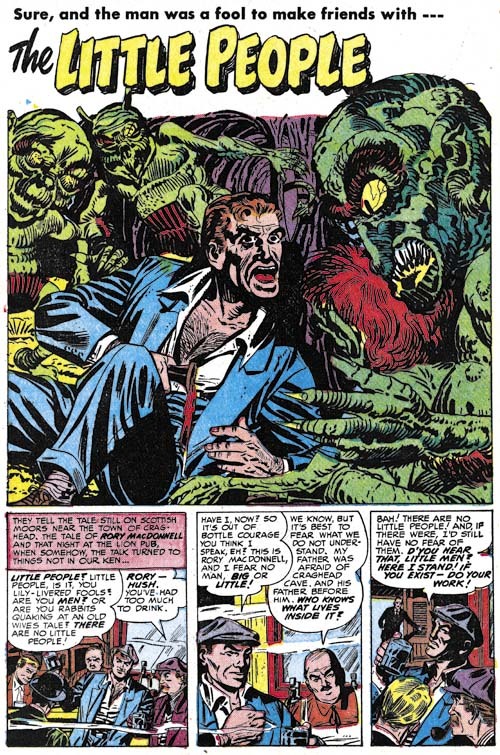 Covers begin to appear at this time where Joe seems to abandon any attempt of mimicking Kirby. 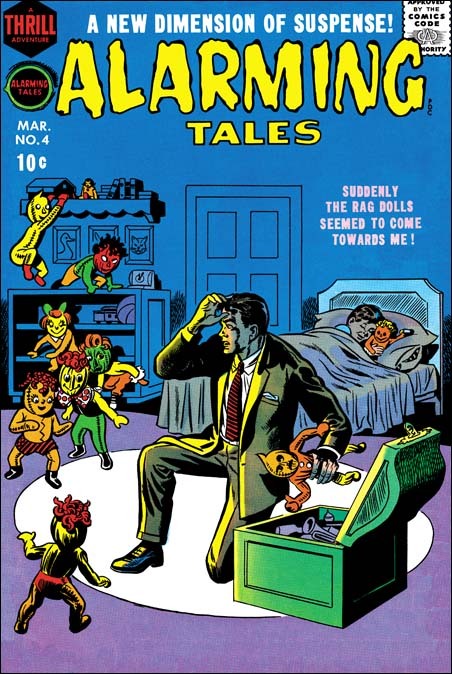 I provide an image of Alarming Tales #4 (March 1958) as an example. Here we find a simpler style of drawing and inking that Joe will often use from here on. Once again Joe has adopts a new style. Posted May 23, 2006 in 2006/05, 6 Mainline, Alternate Takes, Periods, Prize, Topic, z Archive. I’m busy tonight working on the next chapter to The End of Simon & Kirby. But I thought I would point out a happy coincidence that occurred in two chapters. I’ll provide links but chances are both chapters are on this page, so it might be easier to just scroll down. 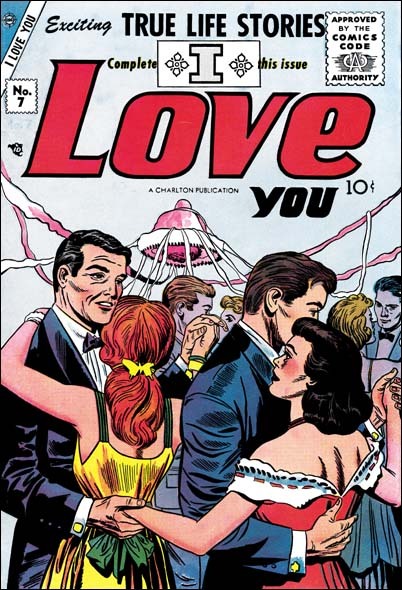 In Chapter 2,I included an image of the cover to Young Love #55 done by John Prentice. 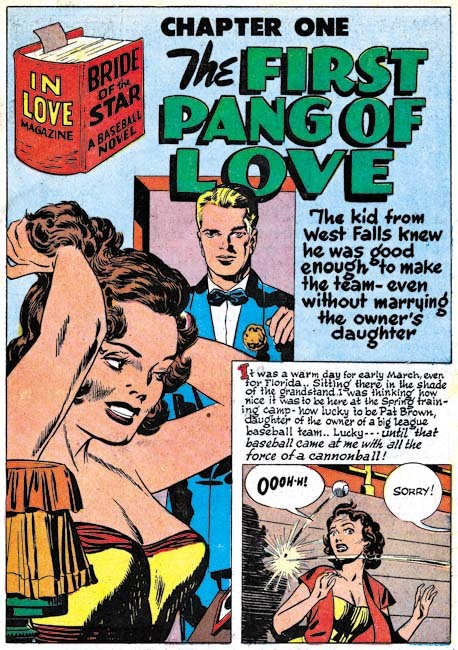 It turns out that that cover is based on a story done by Jack Kirby in the same issue called “Love Wars”. I just happened to provide a scan of the splash page to Jack’s story in Chapter 5. I find such alternative versions interesting for the insight it provides into the artists. Mind you I am not saying that Jack’s splash gives an idea how he would have done the cover. 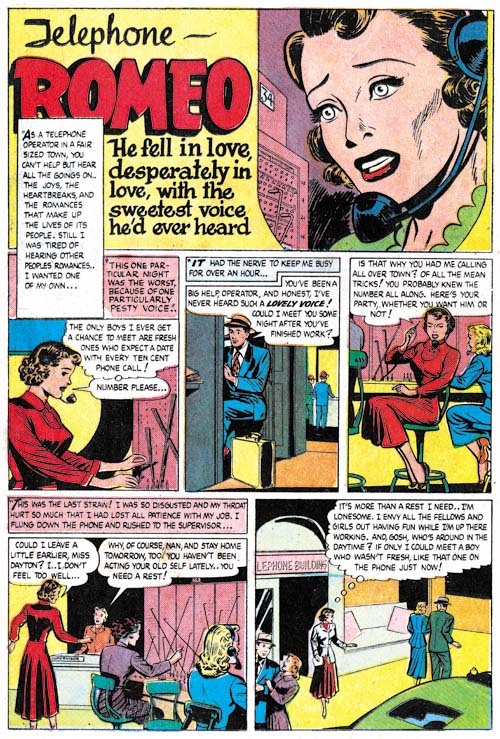 When it came to the romance comics, Jack’s splash pages seem spicier then his covers. This example of an artist doing a cover based on a Kirby story may be unique during the S&K collaboration, I’ll have to check. Also rare are examples of Kirby and another artist doing alternate takes of the same cover. I included scans of covers by Jack Kirby and Bill Draut in “Artists and Models“. I can think of only one other example from the S&K period. 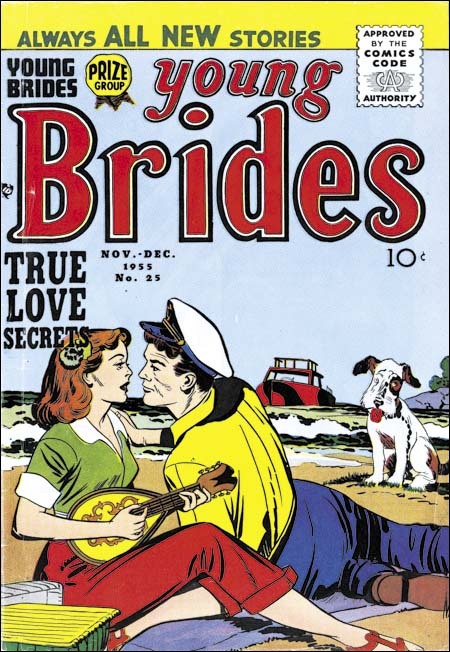 There are however a number of examples of Jack doing the cover based on a story by another artist. I think it may be fun sometime to post a series of examples of these alternate interpretations.